“It was spooky to see the defenders in the deep zone converging on his brother like heat seeking missiles all hitting the same target” (18). I have always enjoyed playing and watching football, and when I read this part of the book you feel like you are on the sidelines, watching a live game. Tim Green, the author, was actually a former football player who now writes books. I see this as a huge advantage because he knows how to properly make someone feel alive in a football situation. This is one of the many reasons why Deep Zone is so intriguing. The beginning of this story starts in New York, a place I have little knowledge in. Ty and his Brother Thane (an NFL superstar) live alone in a large slate roofed mansion. Due to a gambling scheme their naughty Uncle Gus made, their house becomes the target of sneaky mobsters like Zipper. Early on, Thane is rocked in the last play of an NFL game, which results in a reconstruction surgery for his knee. Ty must stay alone in the targeted house with FBI agent, Agent Slutherland. Agent Slutherland is an undercover cop, so when Ty first saw him, he thought he was a mobster. Ty’s reaction resulted in a wound in his hand. While with Slutherland, Ty had his own football team tryouts. Despite a wounded hand, Ty shows perseverance and makes a team that takes him to a football tournament in Atlanta. In Atlanta, Thane and Ty stay in a large, luxurious hotel on the coastline. They think all trouble with the mobsters has ended, but really, it has just begun. Ty plays his football tournament while meeting someone who looks like Ty and has football abilities like him. The two go on football and other adventures together in the beautiful Atlanta weather. 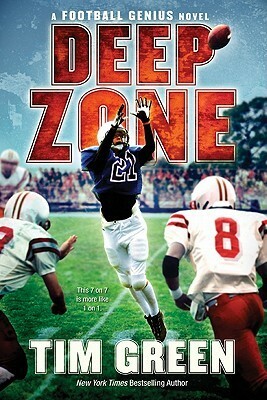 When reading Deep Zone or one of Tim Green’s other books, you feel a sense of urgency to read on about the great football games or action that happens off the field. Tim’s ability to create such an intriguing mystery keeps the book interesting, and makes sure you are always at the edge of your seat while reading. “Ty’s heart jumped into his throat. He froze in panic, unable to move as he heard whoever it was sneak past his bedroom door” (95). The one thing about this book that I didn’t like was the beginning. At first, even the word football is barely mentioned and I didn’t know if I was reading a football book. This slow and forgettable beginning soon sped up to be the fast paced action and mystery that Tim Green is so good at. Except for the slow start, this book kept me reading all day long. Once you get into the action you are always thinking about, what’s going to happen to Ty? A flashlight under the sheets book that will almost scare you at some points. I would recommend this book for kids in middle school who have an interest in football or mysteries. I loved this book and you will too once you choose to find out what happens to Thane, Ty and their friends. This entry was posted in Book Reviews and tagged book review, sports, tim green by SMES Student. Bookmark the permalink.